Are you looking for a little vibrating pager motor to use in that special Halloween project, but don’t want to spend the typical buck per motor price? Well, a special clearance sale at The Electronic Goldmine features a Belkin Universal VIBRA Clip (G15260) cell phone adapter at the nice price of $0.79 each. 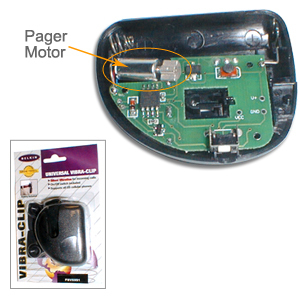 Just open the case and remove the pager motor—complete with soldered leads. Plus you get an “AAA” battery and a stylish cell phone belt clip—all for less than a buck. There are so many awesome cell phone cases and other cell phone accessories coming out right now, I don't know which to get first.